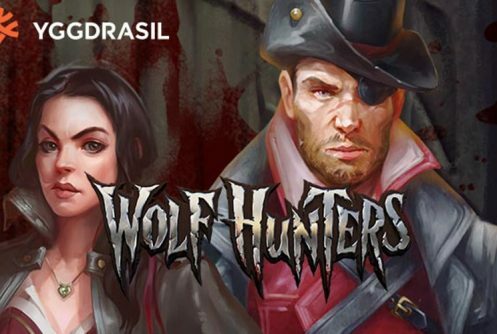 Wolf Hunters is a medium to high variance horror/werewolf themed slot from Yggdrasil with 20 paylines, 5 reels that pays a top cash prize (non-progressive) of 200 coins on a single spin. In the main game the wild symbol gives you re-spins, when the hunters defeats the werewolf, wilds spread across the reels for the big wins. 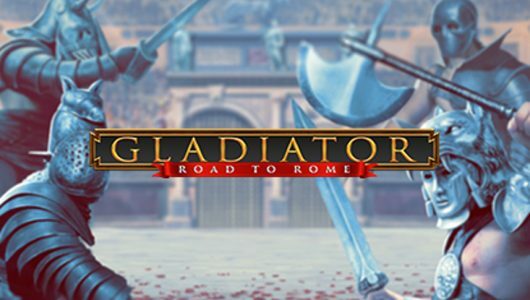 There are three free spins features too, they’re played when the male hunter appears on the outer left reel and the female hunter on the outer right reel – 10 free spins will be awarded. The visual side of the slots is not as good as we would have liked but it gets the theme and ambience of the game across. Against the backdrop of the reels you’ll see an eerie-looking Gothic city while symbols on them are the werewolf, the Wolf Hunters (male and female), red hearts, blue diamonds, purple spades, green clubs, stakes, huge traps to catch the werewolf, green bottles with poison in them, the wilds and sticky wilds. The most valuable symbol is the werewolf, 5 of them on the reels at the maximum wager pays 500 coins. The werewolf’s strength is decreased for every hit on it when it reaches 0, the Slayer Free Spins feature is played. The Hunter’s rage increases by +1 for every successful hit it has on the werewolf. Once again the symbol transforms into a sticky wild that offers a re-spin. An interesting feature about Wolf Hunters is that it’s fitted with 3 free spins features. The first one is played when 2 scatters (male and female wolf hunters) appear on the left and right reels – the other two free spins are initiated when rage meters (water bowls) to the left and right of your screen are filled with rage points. Wolf Hunters has an average return to player percentage (RTP) of 96.3%. There are multiple customization options like Max Bet, Auto Play, coin betting range, graphics and audio settings. The coin value is 0.05 to 5.00, if it’s set at 5.00 you’ll bet £100 a spin. We didn’t play the slots with real cash but only in the free mode at an average bet of €4. 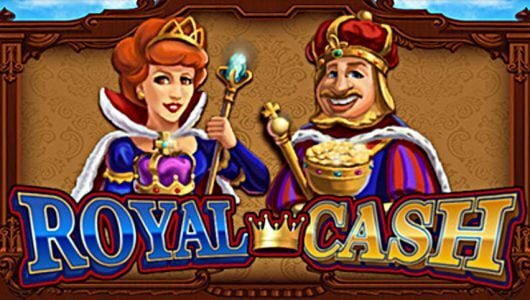 At this betting range payouts during the base game and free spins are good. The standard wild symbol completes winning combinations when it replaces symbols adjacent to it bar the scatter symbols (male and female wolf hunters). If a hunter defeats the wolf the wolf transforms into a sticky wild giving you a re-spin. 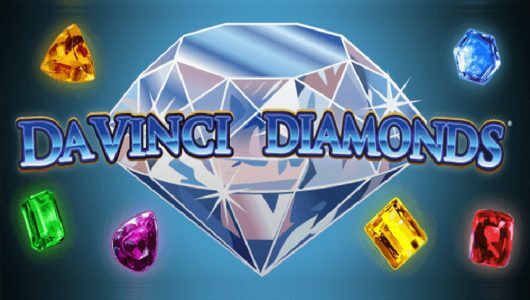 The normal or standard free spins feature is triggered when the male and female hunter appear on the reels simultaneously – 10 free spins are awarded. 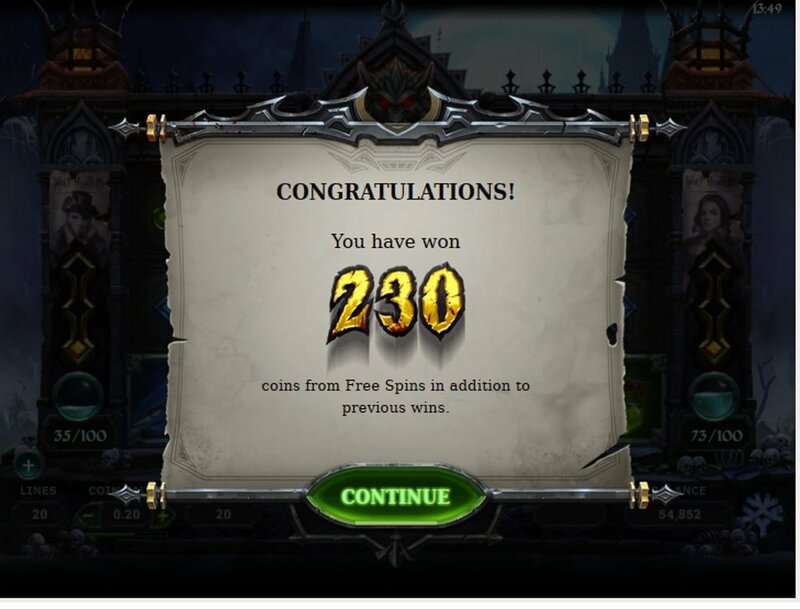 Extra free spins or re-spins can be won when a hunter defeats a wolf. Once the feature is active you can upgrade your hunters (make them stronger), if you succeed the werewolf becomes an expanding wild that covers all the reels. 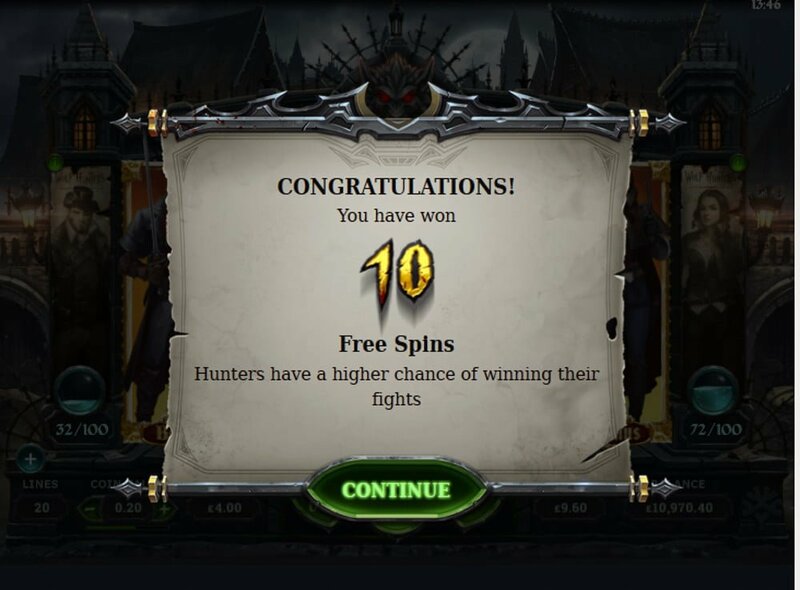 If you succeed in collecting 3x huntress free spin symbols, not only will you upgrade the huntress but you will receive an additional two free spins. Also, the huntress’ chances of defeating a werewolf improves significantly by turning the werewolf wilds into expanding wilds. When the hunter collects 100 rage points you’ll trigger the rage free spins feature that gives you 7 free spins. The difference here is that your hunter is fully upgraded and the werewolf symbols are all wilds meaning that extra free spins or re-spins are on the cards. 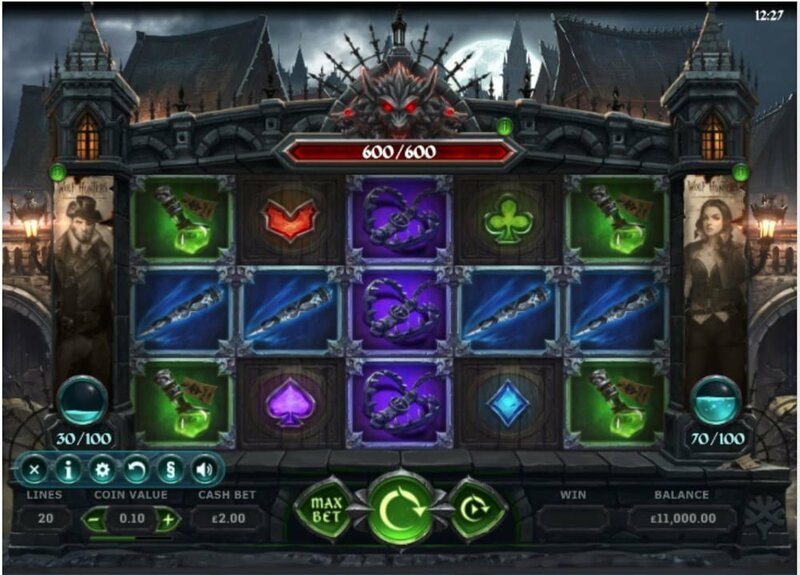 The Slayer Free Spins is triggered when the werewolf health bar at the top of the reels is whittled down to zero, all werewolf symbols are fully wild. Wolf Hunters is a great slots but it does require a bit of work especially if you’re out to trigger the free spins bonus modes. 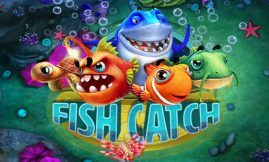 Your chances of winning a substantial amount of cash increases thanks the wilds that spread out across the reels during the free spins. In the base game defeated wolf symbols turn into sticky wilds for a re-spin boosting wins. Are base game wins okay? Yes they are, each defeated werewolf becomes a wild which offers you a re-spin improving your chances of getting a winning spin. Wolf Hunters is compatible with HTML3 in other words mobile phones (iOS, Androids, tablets). Don’t play the game with normal mobile data rather play it with your Wi-Fi tuned on. How many spins is need to trigger the free spins features? Since Wolf Hunters is a medium to high variance slot triggering the free spins doesn’t come cheap. Based on our game play (free mode) and the feedback we’ve received from players it takes around 65 spins to trigger the standard free spins feature.